In the Year of Our Lord 517, Arthur, son of Uther Pendragon and Ygraine of Cornwall, pulled his father's sword from the stone in the ancient hill fort at Camelud not far from the old abbey at Glastonbury Tor. By removing the sword — as so many had tried but failed — Arthur revealed himself to be the True King of the Britons. Several years have passed since then. Years of civil war and years of border wars. Arthur is still a young man, leader of the most powerful war band in the country. The Warriors of the Way are mounted men, fighting with lance and long sword. They are sworn to uphold the law and mete out justice. The sit in council as equals to advise the king, and they have taken to calling themselves cnyhts — an old word that means servant, for they are the servants of the king's justice. Over the years of his rule, Arthur has repaired and fortified the old stone fort at Camelud. A small town has grown up around the walls, all contained within a wooden palisade. The wooden walls and the stone are painted white and can be seen on the hill for miles around. It is the capitol city of Arthur's kingdom — what is left of Britain in the West. The the East the Saxons threaten. Welsh tribes are to the north across the Severn Sea. And the Francs raid continuously along the shores to the south. Although his kingdom is shrinking and will one day be no more than legend, right now, in the early years of the sixth century, Camelud is an important, independent city in the British Isles. Envoys and supplicants, petitioners and justice seekers find their way here every day to speak with the king, or the wizard who stands at his shoulder. The come to win influence, to seek favors, to learn new arts, or just to see — and on day tell the tales of the Court of King Arthur and his Knights. Each of the Player Characters is arriving at Camelud this day. It is the second Thursday after Easter — at the very beginning of the New Year — the ninth year of King Arthur's rule in the year 526 Anno Domini as the Roman Church reckons such things. Follow this link to learn more about the Player Characters and the various Non-Player Characters who make up our story. We use MetaGaming's The Fantasy Trip rules system to manage the character's interactions. Click here to see maps and images of the various places in Britain that the Player Characters will be visiting. Some areas are hidden or vague until the game play reveals their details. Our story so far. Follow this link to read the details of who did what, and what was aid in return. To join the game, subscribe to the Yahoo Group. 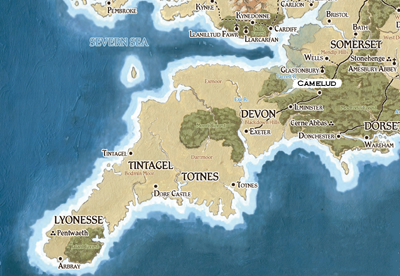 The Player Characters gather at Camelud -- King Arthur's capital city in what is left of post-Roman Britain. They have come to see the young king for many reasons. Soon he will assign them a quest -- a journey that will change their lives forever. This site is intended for my personal use to play a role playing game. It is a not-for-profit enterprise. Images and rule systems credited when I know where they came from. I built this page using a CSS Template by webJestic.NET I added a boatload of stuff myself, but they deserve some credit.